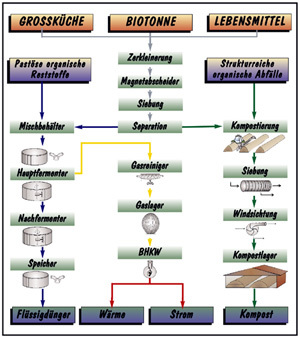 Process technique for the treatment of wet biowaste. Material separation into liquids and solids. With this type of separation only 50 % of the material goes into fermentation, therefore lower investment volume and simpler technology. High energy output during fermentation. High economic efficiency even for small plants from 8000 t/a. Robust technology for the waste industry.